Set of 3 cotton towels with village motifs embroidered strip, made by Penduka artists from the slums of Katutura district, Windhoek. 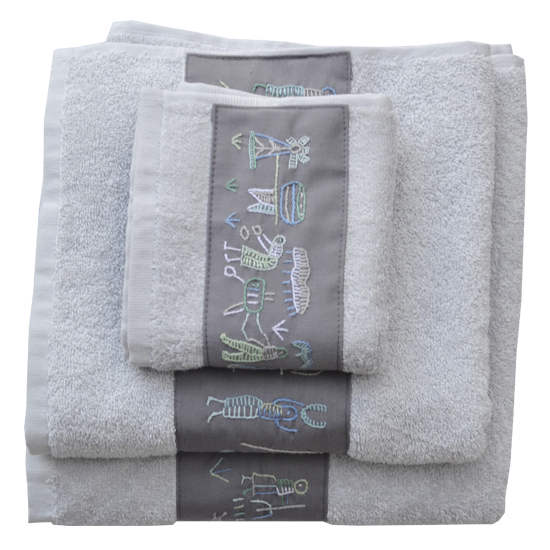 One towel each of 30cm x 50cm, 45cm x 90cm and 60cm x 110cm. Set of 3 cotton towels with village motifs embroidered strip, made by Penduka artists from the slums of Katutura district, Windhoek. Village embroidery motifs vary depending on what story the individual Penduka embroiderer has to tell (village scenes, fetching water, Katutura street scenes....). Available in grey with aqua coloured stitching. One towel each of 30cm x 50cm, 45cm x 90cm and 60cm x 110cm, machine washable at 60 °C. For other specific colour/ size variants or personalised motifs please contact us.